When people are on the air the opportunity for potential embarrassment and humor constantly finds itself. This is exactly what occurred on live TV while a host and a commentator were discussing South Korea, only to be hilariously disrupted by the kids of the man being interviewed. 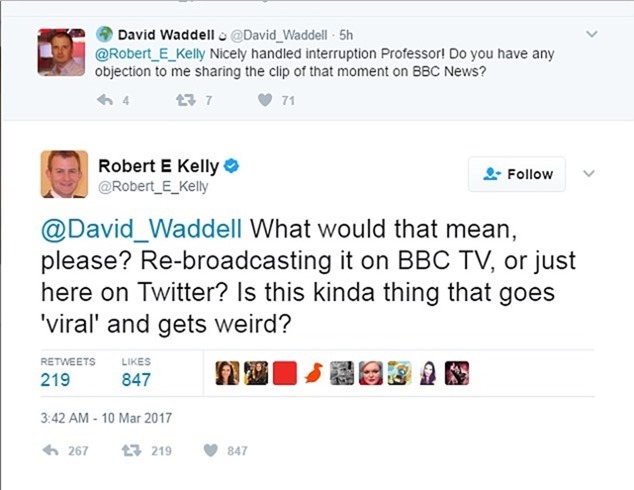 The amusing video clip displays the commentator and Political science professor Robert Kelly, fielding questions from a BBC host about some concerns regarding South Korea’s president and how he was just impeached. Out of the blue, a young child comes walking into his home office and begins to dance around behind Kelly. Kelly concentrates thoroughly, focusing his eyes completely into the picture while he tries to control his little girl, who definitely seems interested to find out what Daddy is doing. His adult troubles quickly multiply as another little one comes into the room strolling along in his baby walker. 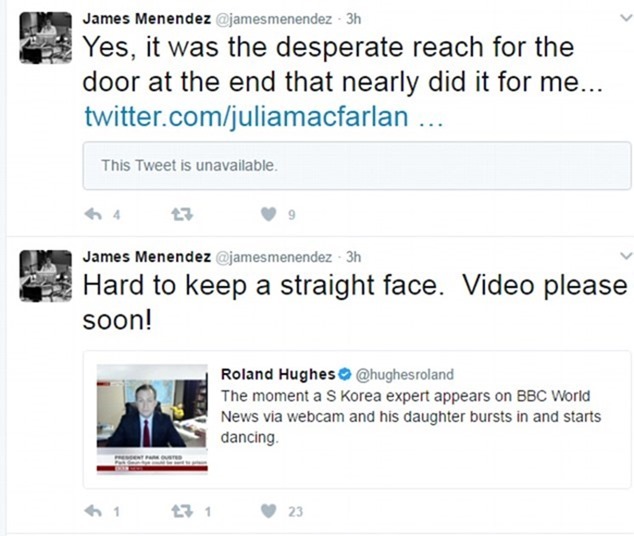 Kelly’s wife then barrels through the doorway, sliding around due to haste and knowing that her husband is on an important interview. She gets a hold of the kids and tries to pull them outside the home office as one of them is fussing and the little one in the walker isn’t easily going back through the doorway. Shortly after that, the wife is able to migrate them both away from the scene and Kelly’s interview goes on. There was a lot of commotion on social media shortly after the interview was over. Many users on twitter had a go at the hilarious interruption. Share this hilarious footage faux pas with your friends by pressing below!